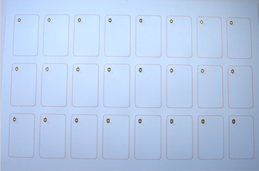 We have ultrasonic and flip technique to produce PVC Card Inlay. B. ultrasonic, it has the best working performance no matter for the reading distance, or the card’s surface. SCC provides card manufactures with a reliable and convenient semi-product for the manufacture of finished contactless cards,Prelam stands for Pre-laminated. customer.Reliability, durability and prefect electrical performance,compliant with divers standards. SCC RFID Card Inlay is ideal semi-products for laminating contactless card,tag applications such as automated fare collection,access control,ePayment and identification.